A Smithsonian conservator displays the cover page from Thomas Jefferson's Bible. Editor's note: Mitch Horowitz is editor-in-chief of Tarcher/Penguin and editor of Penguin’s new reissue of The Jefferson Bible. (CNN) - Imagine the following scenario: A U.S. president is discovered to be spending his spare time taking a razor to the New Testament, cutting up and re-pasting those passages of the Gospels that he considered authentic and morally true and discarding all the rest. Such an episode occurred, although the revised version of Scripture remained unseen for nearly seven decades after its abridger’s death. Thomas Jefferson intended it that way. During most of his two terms in the White House, from 1801 to 1809, and for more than a decade afterward, Jefferson - the third U.S. president and the principal author of the Declaration of Independence - committed himself to a radical reinterpretation of the Gospels. 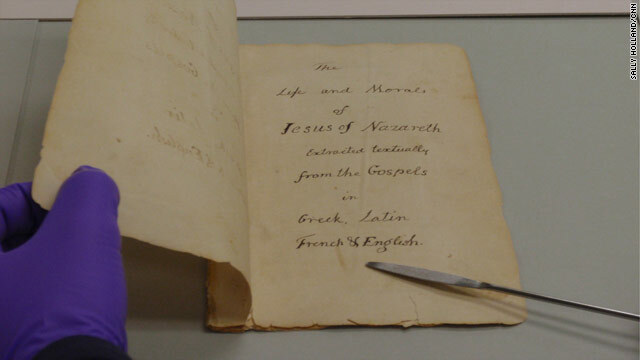 With a razor and glue brush at this side, Jefferson lined up English, French, Greek and Latin editions of Scripture and proceeded to cut up and reassemble the four Gospels into an exquisitely well-crafted, multilingual chronology of Christ’s life. Jefferson lined up different editions of Scripture. In Jefferson’s view, this revision represented a faithful record of Christ’s moral code, minus the miracles that the Enlightenment-era founder dismissed as historical mythmaking. The book eventually became known as The Jefferson Bible and is now being rediscovered in new editions, including one published this month by Tarcher/Penguin, and as the focus of a Smithsonian exhibit. Ask most people today if they have heard of Jefferson’s Bible and you will receive blank stares. Indeed, for much of American history, The Jefferson Bible was entirely unknown. Jefferson intended it as a work of private reflection, not a public statement. As contemporary readers discover the work, it is tempting to wonder how American history might look different had Jefferson’s radical document come to light closer to its completion. Jefferson was still working on his Bible during his presidency, so its theoretical publication wouldn’t have compromised his electability. But if the book had been made public after its final completion in 1820, when Jefferson had only six more years to live, it likely would have become one of the most controversial and influential religious works of early American history. 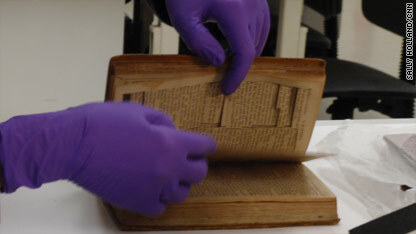 A curator handles a "source" Bible from which Jefferson cut out passages. That was a scenario Jefferson took pains to avoid. After being called an “infidel” during his 1800 presidential race, Jefferson knew the calumny he could bring on himself if word spread of his “little book.” Although he had his work professionally bound, he mentioned it only to a select group of friends. Its discovery after his death came as a surprise to his family. Jefferson’s wish for confidentiality held sway until 1895 when the Smithsonian in Washington made public his original pages, purchased from a great-granddaughter. In 1904, Congress issued a photolithograph edition and presented it for decades as a gift to new legislators, a gesture that would likely cause uproar in today’s climate of political piety. Because of the book’s long dormancy following Jefferson’s death, and its limited availability for generations after - arguably the first truly accessible edition didn’t appear until 1940 - The Jefferson Bible has remained a curio of American history. So how would the earlier publication of The Jefferson Bible have changed American history? It's impossible to know for sure, but the 1820s inaugurated a period of tremendous spiritual experiment in America: It was the age of Mormonism, Unitarian Universalism and Shakerism, among other new faiths. There’s little doubt that many Americans, who were already fiercely independent in matters of religion, would have seen The Jefferson Bible as the manifesto of a reformist movement - call it “Jeffersonian Christianity” - focused not on repentance and salvation but on earthly ethics. Such a movement could have swept America, and also have spread to Europe, where Jefferson was esteemed. A broad awareness of Jefferson’s work would have surely engendered a more complex view of the religious identity of Jefferson and other founders. Indeed, one of Jefferson’s most trusted correspondents while he was producing his Bible was his White House predecessor, John Adams, who in turn confided to Jefferson his distrust of all religious orthodoxy. These men were impossible to pin pat religious labels on. Because Jefferson published relatively little during his lifetime, the appearance of The Jefferson Bible would have created a different, and more confounding, public image of the statesman as someone struggling deeply with his own religious beliefs. The Jefferson that appears behind his reconstruction of Scripture is someone who brushed aside notions of miraculous intervention and canonical faith. As The Jefferson Bible conveys, however, Jefferson considered Jesus’ moral philosophy the most finely developed in history, surpassing the ethics of both the ancient Greeks and the Hebrews. He insisted that Christ’s authentic doctrine was marked by a stark, ascetic tone that clashed with the supernatural powers attributed to him. Jefferson’s minimalist approach to the Gospels reveals an attitude that he disclosed only privately, just months before his death: “I am of a sect by myself, as far as I know." In that sense, Jefferson the politician wouldn’t have stood a chance in the current presidential race, where faith and piety are on constant display. The political process might be more open today to candidates of varying degrees and types of belief if The Jefferson Bible were more central to the nation’s history. 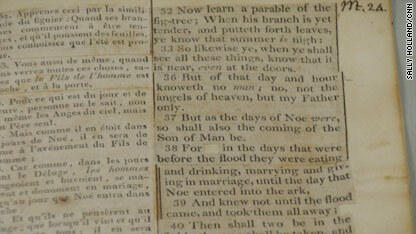 The Jefferson Bible opens a window on Jefferson’s struggle to find a faith with which he could finally come to terms. It was this kind of intimate, inner search - not the outward pronouncement and establishment of religious doctrine - that the man who helped shape modern religious liberty sought to protect in America. The opinions expressed in this commentary are solely those of Mitch Horowitz. Wonderful blog! Do you have any suggestions for aspiring writers? I'm hoping to start my own blog soon but I'm a little lost on everything. Would you advise starting with a free platform like WordPress or go for a paid option? There are so many choices out there that I'm completely overwhelmed .. Any suggestions? Bless you! nfl jerseys shoes Grey Locarno Soldes.Livraison Free! Buy High Quality Cheap nfl jerseys cheap nfl jerseys for sale. We absolutely love your blog and find many of your post's to be just what I'm looking for. can you offer guest writers to write content in your case? I wouldn't mind creating a post or elaborating on many of the subjects you write with regards to here. Again, awesome web log! Mrs Ness told the courtroom: "At about 9.15pm, Dr Barnes went outdoors the pub to generate a simply call on his cell phone to his son. He was suddenly surrounded via the defendant plus some other guys. An individual person reported: 'We just want to chat to you', and grabbed his arm. A fascinating discussion is definitely worth comment. I do think that you ought to write more on this issue, it may not be a taboo subject but generally people do not speak about these subjects. To the next! Best wishes!! Good information. Lucky me I came across your site by chance (stumbleupon). I have book marked it for later! Hey there! I just would like to offer you a big thumbs up for your great information you have got right here on this post. I’ll be coming back to your site for more soon. I was amazed that Gene sold my residence so quickly. It was on the market for only two weeks until the new owners decided to purchase. I was delighted that Gene sold my home so quickly. It was for sale for only 2 weeks before the new owners decided to purchase. the bassinet is made to only final your little one a number of months as they will expand extremely speedily. Hi there, You've done a fantastic job. I’ll definitely digg it and personally recommend to my friends. I'm confident they will be benefited from this website.